Thousands of protesters are rallying across Ukraine for the second day, angry at the government's move to delay an association deal with the EU. Opposition leaders including world heavyweight boxing champion Vitali Klitschko joined the protest in Kiev. In the western city of Lviv, several thousand people took to the streets. Ukraine has come under intense pressure from Russia not to sign the wide-ranging trade and association agreement at a summit with the EU next week. Russian President Vladimir Putin, who wants Kiev to join the Moscow-led Customs Union, accused the EU of blackmailing Ukraine to sign the deal during the summit in Vilnius. "We have heard threats from our European partners towards Ukraine, up to and including promoting the holding of mass protests," Mr Putin said. 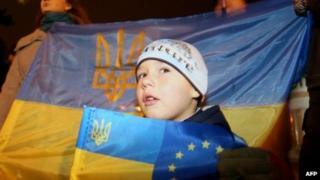 On Friday, protests are being held in Kiev, Lviv, Luhansk and other cities across Ukraine. Activists say they will be rallying every day and are planning a mass demonstration in Kiev on Sunday. They also are comparing their protests with the 2004 Orange Revolution. Anti-riot police have been deployed in Kiev's Independence Square, but so far there have been no reports of violence. A Kiev court has ruled that tents must not be erected on the square. In 2004 tents were a big feature of the protests against Viktor Yanukovych, the pro-Moscow presidential candidate whose election was marred by voting abuses. He is in power now and his arch-rival, Yulia Tymoshenko, is in jail. Protesters are again using social media to mobilise supporters - just like they did on Thursday night. In 2004 Ukrainians overcame not just their fear of the authorities but their traditional and often mocked individualism. "I mind my own business" gave way to collective responsibility for honest elections. Their weapon was not just strength in numbers but also SMS messages. Mobile phones were key for organising protests, avoiding police cordons and ordering supplies. On the ground floor of the Kiev Town Hall, where protesters were warming up after long cold hours in Independence Square, were phone chargers. "Nokia to the left, Motorola and Samsung to the right," read the posters. It's mostly Twitter protests now - this is the tool of choice. Everyone seems to be online, but the big question is whether protests on social media will replace big street rallies. Many people in Ukraine will tell you of their protest fatigue, and many believe that not just the numbers but the spirit of the Orange Revolution will hardly be repeated - whatever the tools. This came after parliament - dominated by Yanukovych supporters - rejected six draft laws which would have led to Tymoshenko's release, and the government then saying it was halting its preparations aimed at signing the agreement with the EU. The EU has urged the release of Ms Tymoshenko, a leader of the Orange Revolution, which sought to eradicate cronyism from Ukraine's politics and loosen historically close ties to Russia. On Friday, Prime Minister Mykola Azarov said the decision not to sign the deal was motivated solely by economics and was "tactical". He said it did not alter Ukraine's overall development strategy. "The decision to suspend the EU association agreement signing is difficult, but the only one possible in the current economic situation in Ukraine," he said. Opposition deputies booed him and shouted: "Shame!". Some also threw bundles of paper in his direction. The opposition also displayed the EU and Ukrainian flags in the chamber side-by-side. The Ukrainian government says it is now looking into setting up a joint commission to promote ties between Ukraine, Russia and the European Union. Ukraine depends on imports of Russian gas, but recently the supplier, Gazprom, complained that Ukraine had fallen behind in payments. Pipelines transiting Ukraine pump Russian gas to many EU member states. In 2009 Russia cut off gas supplies to Ukraine in a dispute about prices, causing fuel shortages across Europe in the middle of winter. Explaining the government's controversial decision, Mr Azarov told MPs that Russia had voiced concern about "possible duty-free imports of European goods via Ukrainian territory, leading to significant economic losses". And his government, he said, had not received any International Monetary Fund assurances that Ukraine would be compensated for any closure of markets in the Russian-led customs union. Russia has a customs union with two other former Soviet republics - Belarus and Kazakhstan - and has been urging Ukraine to join it. A free trade agreement with the EU would mean Ukraine adopting different trade rules. Kiev's decision on Thursday prompted EU Enlargement Commissioner Stefan Fuele to cancel a trip to Ukraine. It had been planned for the run-up to the key "Eastern Partnership" summit between the EU and several ex-Soviet states, which will be held in Vilnius, Lithuania, on 28-29 November. Ukrainian opposition leader Arseniy Yatsenyuk called the government's decision state treason, accusing President Yanukovych of selling out to Moscow in exchange for cash and ensuring his re-election in 2015. "This is a well-planned scenario by Yanukovych: how to sell the Ukrainian state and to buy himself a seat of the governor of Little Russia as part of the great Russian empire," he said.